As far as I know, this beer has been discontinued by Widmer, however, I will always have fond memories of this one. Excellent hop/malt balance. As the beer got warmer, a sweet, golden honey flavor appeared. 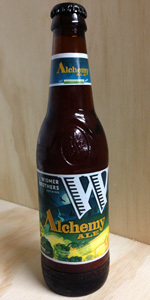 True alchemy indeed, and from Widmer of all places! Hope this one makes a reappearance someday. I dropped by The Fridge tonight on the way home from a screening of "Michael Jackson: the Beer Hunter, a Documentary" as I am watching Game 3 of the BOS/Pens series. Beer + hockey = better than beer + movies. From the bottle: "Alchemy Ale turns hops, water, malt and yeast into liquid gold. It's the purest expression of our beliefs about great beer. "; "Perfectly balanced, perfectly hopped and perfectly refreshing. [undersigned] [the brewers]". My pour created a big, fluffy, tawny finger of head with great retention. Color was a pin-bright amber. Nose smelled deeply of pine and the question was again begged of where does and APA end and an AIPA begin? Who friggin' cares and has two thumbs? This guy! Hops keep me happy and I am anything but a style maven. Mouthfeel was medium and the intensity of the hops was just muted enough to qualify it as an APA, but just several years ago, I might have wondered. Finish was semi-dry and I was very glad with my choice as I watch the game. 12oz brown bottle poured into a standard pint glass. Bottle comes with a freshness date though it's kind of hard to make out what it says. Appearance: Bright copper in color. About a 3/4" of white head. Retention had potential but faded out quickly and not really any lacing either. Aroma: Hops are lemony, citric, herbal, and earthy. Some nice toasted and caramel malt aromas swirling around as well. Taste: Follows suit. Citrus-y hops, lemon peel, herbal, minty, dry toasted malt, caramel, residual sweetness. Flavors fade quickly Extremely well-balanced though. Mouthfeel: Medium body with medium carb. Dry finish with some lemony hops bitterness cleans up nice. Overall though it's an extremely well-balanced though not a ton of flavor really sticks with you or stands out. It's a solid serviceable APA.